She wears glasses, but it is unknown if she had them with her when she disappeared. She has eczema on her arms and legs, and the word Diamond is tattooed on her upper right arm. Nike boots, and a McDonald's restaurant uniform consisting of a white tank top, a brown shirt, and black pants. 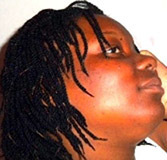 Latisha was last seen after leaving work on August 2, 2010. She has never been heard from again. Due to evidence found, foul play is suspected and suspects were charged and convicted in her presumed homicide. Her whereabouts remain unknown.